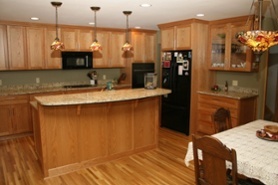 Stone countertops are a durable and beautiful addition to your kitchen, bathroom or floors. However, they cannot stay beautiful without your care and maintenance. It is imperative that you take proper care of your stone so it can reach its full potential and dazzle anyone who comes through your home. Hot water and dishrag or sponge is all you need to clean spills and wipe away crumbs to keep your countertops clean throughout the day. Temporary polishes can be used periodically to enhance the shine in natural stone and granite. These types of polishes are not for maintenance or repair and they are not what make the counter top shiny. Instead, it “enhances” the shine – similar to waxing a car – improves cleaning and provides a small amount of protection. If your granite countertop have become dull for some reason you will most likely need to consult a professional as no chemical or product will restore damage to a granite surface. Blot up spills immediately especially acidic substances like wine, coffee, fruit juices, tomato sauce, sodas and cooking oils. Dish soap won’t permanently damage your granite, but repeated use of soap will cause build-up and dull your countertop’s shine. Use coasters under all glasses, bottles, and cans. Use trivets and hot pads under pots & pans. Use cutting boards. Cutting on the stone will dull and damage your knives’ edges quickly. Use generic cleaning products such as bleach, glass cleaners, degreasers or other common household cleaners. Use vinegar, ammonia, lemon or orange as cleaners. Use bathroom, tub & tile or grout cleaners. Sit or stand on your countertops. Store liquids or toiletry products directly on your countertop surface.